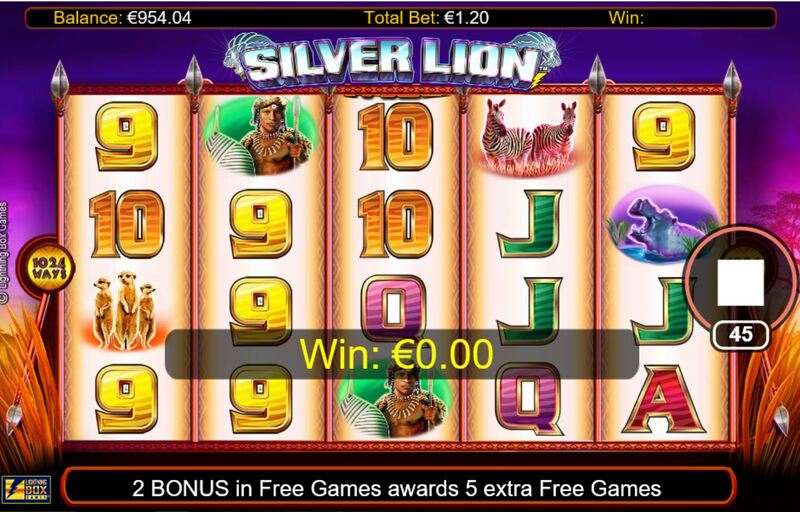 Silver Lion Slot is 1024-way slot with 5 reels and 4 rows from slot game developer Lightning Box Games. I'm sure animal themes aren't really surprising to players as nearly every other slot seems to incorporate them in some way, some examples being WMS's OMG! Kittens, IGT's Cats, Aristocrat's Dolphin Treasure and Bally's Thunderhorn - funny I should mention that, as Silver Lion is an exact clone of the original Bally Game! Symbols are stacked on all reels in various amounts of 1, 2 and 3 and the centre 3 reels have single non-multiplying Wilds. As there are 1024-ways there are no paylines to worry about, just consecutive reels from left-to-right having 2 (or 3 symbols if not animals). The graphics aren't that advanced and the sounds a bit too stereotyped for the theme. 3 gemstone scatters (yawn!) anywhere trigger (oh not again!) 8, 15 or 20 free games. The enhancement, if you haven't guessed already, is that the Wilds on reels 2, 3 and 4 now produce either a 2 or 3x multiplier if active in a pay. This means that wins can be multiplied 2 to 27x. Predictably 2 scatters will add 5 extra spins and 3 or more will add the relevant 8 - 20 spins. 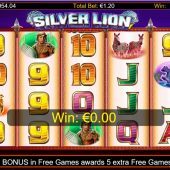 Silver Lion slot will appeal to players of WMS's Raging Rhino which has been hugely popular but was actually a take on the original Bally Thunderhorn slot, but with an extra reel added for even more volatility. Playtech too have got on the Rhino bandwagon with their slot Buffalo Blitz which has emulated the Rhino's 4096-way format, so there is clearly a market for this type of multiway slot with stacked symbols, Wild multipliers and big intimidating animals!